Hello there, residents and visitors of Virginia Beach, welcome back to theFireBrew Bar & Grill Blog. Here, we’re always hungry, but not for food that isn’t made with the freshest ingredients and cooked with poise. Our Virginia Beach restaurant has a diverse menu of artisan pizzas and flatbreads along with the freshest of seafood dishes. As a pizza restaurant located here on the east coast, we pride ourselves in our creative, yet classic, ‘zas. Because our pizza menu is oh-so-delicious, we’ve earned our right to be pretentious about this particular food group. 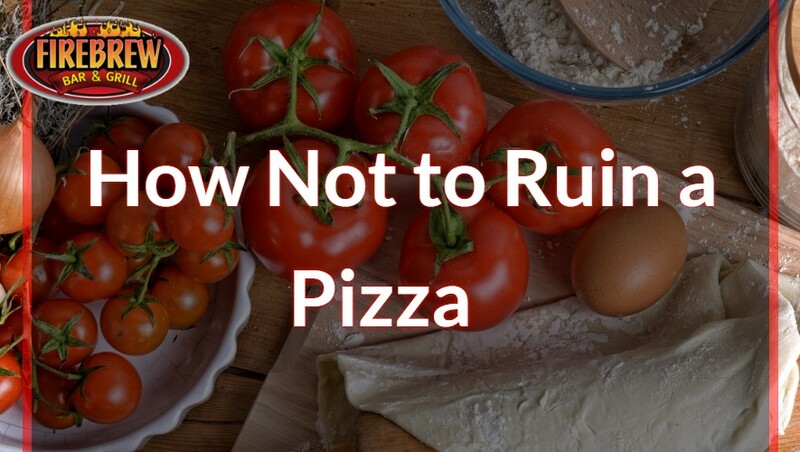 Today, we thought we’d take the initiative to discuss some of factors in pizza-making that leads to a disaster. I’m not sure if you know this, but pie crust is much different than pizza crust. If you’re trying to make a pizza and want to make a yummy crust, don’t grab one of those roll-out pie crusts from the refrigerated aisle and call it a day. It will taste like a strange dessert rather than a yummy pizza. We hoped we didn’t have to go there, but please, please don’t use that cheese that’s in a plastic baggie. Cheese deserves respect. What’s especially worse is if people use bags of cheddar, or a “Mexican taco blend.” Are you joking? It’s pizza, not some sandwich put together by a broke college student who can’t afford his groceries. Please, if possible, invest in the finer things. I don’t care what those dumb commercials state about their pizza being comparable to delivery, it’s not. Frozen pizza is frozen pizza. It was made with the most processed of ingredients just to be wrapped in plastic and shoved into a grocery store’s freezer. There is no way in heck that this pizza should even be called pizza. Call the authorities, because this is a crime. Our restaurant here in lovely Virginia Beach calls for mutiny. While we won’t throw around names, we’re very disgusted about what a certain brand tried to do to pizza. Even worse, they tried to brainwash the children into thinking that that was the epitome of pizza and what to expect whenever you order pizza. NO! These little rounds of bread that kids cover with sauce from a packet and cheese in a little plastic compartment just to be stuck in a microwave are a disgrace. Oh, and remember they tried to market these “pizzas” with candy that you can top it with? Please, parents, refrain from buying your kid these prepackaged lunch meals. Introduce them to what pizza should be when they are young. As you know, FireBrew Bar & Grill refuses to let microwaves and fryers into our facility. Why? Because we care. Anyway, if you’re in the Virginia Beach area and you’re pining for some delicious pizza, brews, and seafood, stop by our restaurant. You won’t be disappointed.